Holly Goes Lightly: March Book Club! 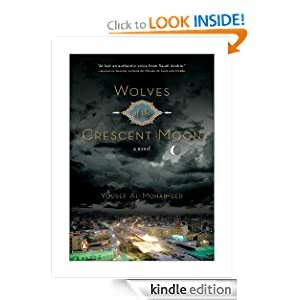 For March, our book club chose to read Wolves of the Crescent Moon, by Yousef Al-Mohaimeed. This is his debut novel, and his writing has been compared to Gabriel Garcia Marquez. The story takes place over the course of one night in Saudi Arabia, when a man discovers a file with documents about an abandoned baby. The story then expands to include three outsiders living in the city, all linked together in some way. I am very excited to read this story. It sounds like nothing I've read before, and promises to be very interesting. In addition to our book club choice this month, I'm also reading Bowl of Cherries by Millard Kaufman and some pieces for my Russian literature class, including Cancer Ward by Aleksandr Solzhenitsyn. Good reading! Just finished The Extraordinary Theory of Objects about an American growing up in Paris and her infatuation with plain little things we often overlook in our everyday lives!!! Oooh, I just won a Kindle Fire and am looking for some books to try! i just love these kind of books! !nice!